﻿When wastewater first enters the treatment plant from the collector system, rags, large solids, and sand must be removed before continuing with the treatment process. Bar racks, screens, and augers are used to remove rags and large solids. A grit chamber is used to remove sand from the process. 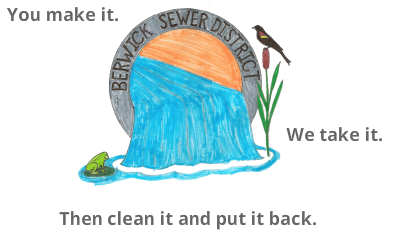 Berwick Sewer District uses an auger to remove solids/floatables (e.g., baby wipes, "flushable" wipes, plastic applicators) before the treatment process. Auger operating at the Berwick Sewer District.